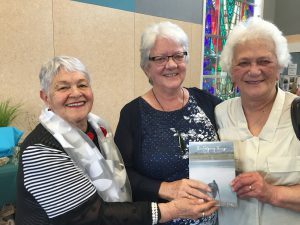 The February edition of WelCom, the monthly newspaper for the Archdiocese of Wellington, made mention of last December’s launch for Sr Anne Powell’s fourth volume of poetry, The Edge of Things. Great to see it there and remember the special day it was. Mike Fitzsimons, of Fitzbeck Creative, said Anne had found her poetic voice, ‘deeply spiritual rather than narrowly religious’, with ‘plenty of attitude’ and demonstrating a keen awareness that ‘God is in all things’. The launch had look and feel of a liturgy, celebrating the spiritual and grounding quality of Anne’s poetry. It featured the reading of favourite poems accompanied by music and story, a blessing of the book by two local kuia and words from Anne about how the poems came to be written. The Edge of Things is published by The Cuba Press. It can be purchased online from the Cenacle website cenacle.org.nz ($25 +$5 p&p); The Cuba Press; and from good bookshops.